This time I created a Cleopatra inspired makeup look, which is a very bold and glamourous one, I've always been fascinated by the egyptian culture and it always has been an inspiration in beauty and fashion shows aswell and the beautiful Cleopatra's makeup style is still iconic nowadays with that dramatic eyeliner, golds and greens. I tried to recreate the proper look of Cleopatra with a black wig with bangs and a golden beaded fringe headpiece, hope you like it guys. Well guys, I really hope you enjoy this makeup look and I would be happy if you leave comments too. *swoon* this is PERFECTION!!! i'm like dying, it's so awesome. WOW! You nailed it! Gorgeous! Cleopatra never looked this beautiful! This looks amazing! 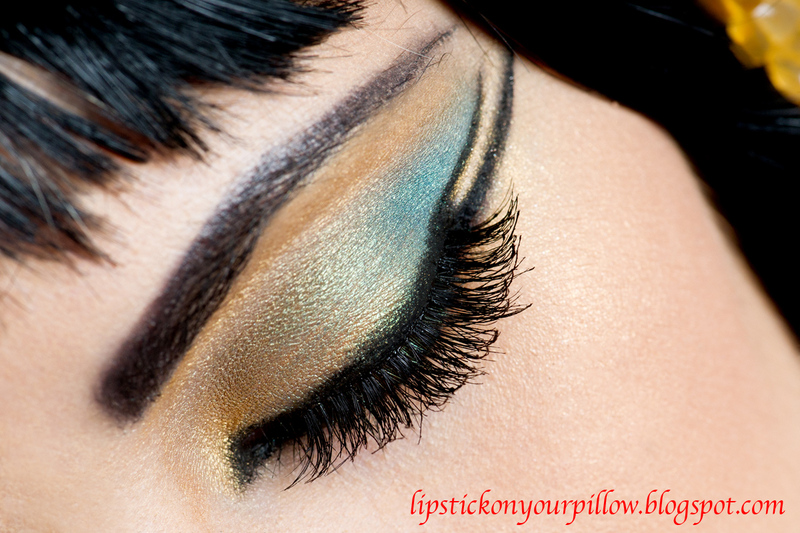 It would be the perfect makeup look for someone who is going to be Cleopatra for Halloween! you're incredibly talented -- and for that, i am extremely jealous. cute blog, by the way! i really like it. Thanks a lot Alexandra, I'm really happy you like my blog, kisses. Thank you all for your kind words and your appreciation, it means the world to me. Kisses. You're too kind Sanya, thank you, kisses. Thank you so much my sweeties Jillian and Mandy, I really appreciate your kind words...Kisses. I have one more party tomorrow (Monday) but I got to test drive the look Saturday night.